Pulling from a unique ten year growth study involving 50,000 brands, Jim Stengel shows how the world's 50 best businesses—as diverse as Method, Red Bull, Lindt, Petrobras, Samsung, Discovery Communications, Visa, Zappos, and Innocent—have a cause and effect relationship between financial performance and their ability to connect with fundamental human emotions, hopes, values and greater purposes. Do You Know Your 'Brand Ideal'? In 1812, a young man named Louis Vuitton traveled 400 miles from his home in eastern France to Paris to begin his career as an apprentice luggage maker. Today, the $8 billion Louis Vuitton brand still embodies the ideal of journey and exploration, writes Jim Stengel, author of the book Grow: How Ideals Power Growth and Profit at the World's Greatest Companies. According to Stengel, any great brand will represent an ideal that defines the values and priorities of the company. "Brand ideals have to be genuine expressions of what you believe and who you and your people are as a business," he explains. The concept of this brand "ideal" arose from two studies on leading brands that Stengel conducted, one while still the global marketing officer of Procter and Gamble (P&G) and another during a period of 10 years, after leaving P&G to form his own consulting company. Eliciting Joy: Activating experiences of happiness, wonder and limitless possibility. Enabling Connection: Enhancing the ability to connect with one another and the world in meaningful ways. Evoking Pride: Giving people increased confidence, strength, security and vitality. Impacting Society: Affecting society broadly, including by challenging the status quo. At P&G, for example, the marketers of Downy were once focused on making towels softer and fluffier. Eventually, Stengel writes, they "discovered the potential for Downy to do something much more interesting: satisfy people’s need and desire to stimulate and renew the senses of touch, smell and sight." Downy had discovered the brand ideal of "eliciting joy." Discovering or rediscovering the ideal for your brand is only the first of what Stengel calls his five "must-do's" for leveraging an ideal into a successful brand. The second must-do is to build your culture around your ideal. The Pampers brand was backed by a deeply fragmented and contentious organization with a culture of fiefdoms and no driving purpose beyond baby "dryness." Today, the brand is unified behind an ideal of developing healthy babies and toddlers. The other three must-do's for leveraging an ideal, according to Stengel, are: communicate the ideal to engage employees and customers; deliver a "near-ideal customer experience"; and evaluate your progress and your people against your ideal. 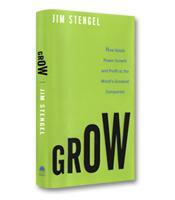 Although some of the companies featured in Grow are certainly becoming familiar to business book readers, the focused framework that Stengel brings to the topic of building a successful brand, backed by research and his extensive experience, will spark many companies to uncover the ideal that could bring their brands to life in the minds of their customers.